The Game Ready System combines Intermittent Compression with Circumferential Cold Therapy in one fully adjustable, easy-to-use application.RICE (Rest, Ice, Compression, Elevation) has long been used to treat acute and chronic injury and to assist in the recovery and rehabilitation after Orthopaedic surgery. Traditional ice packs, cold therapy and static compression devices can be messy, require constant supervision, ongoing maintenance and difficult to use. Developed by scientists and doctors using proprietary NASA space suit technology, the Game Ready System simultaneously delivers both adjustable cold therapy and intermittent compression, making it easy to apply the two most difficult-to-manage aspects of the RICE regime.The microprocessor-driven Control Unit and our Dual-Action Anatomical Wraps, featuring NASA spacesuit design, enable your treatment with the Game Ready System. The Game Ready System continuously circulates cold water from the control unit’s ice reservoir, via a connector hose, through an inner chamber of the anatomical wrap (this chamber is located closest to the body) before returning to the ice reservoir. As a complete loop, the cold water is refreshed through the ice before returning through the anatomical wrap, thus delivering continuous cold therapy to the body part, allowing heat to be removed from the treatment site. Simultaneously, the control unit pumps air into the separate, outer chamber of the anatomical wrap, intermittently inflating and deflating according to the pressure setting that is selected. The compression not only assists in preventing/ limiting swelling, but also conforms the Anatomical Wrap to the contours of the body. This increases the surface contact and aids the delivery of the circumferential cold therapy. MORE EFFECTIVE COLD. MORE EFFECTIVE COMPRESSION. ACTIVE COMPRESSION SQUEEZES BENEFITS OUT OF COLD THERAPY. 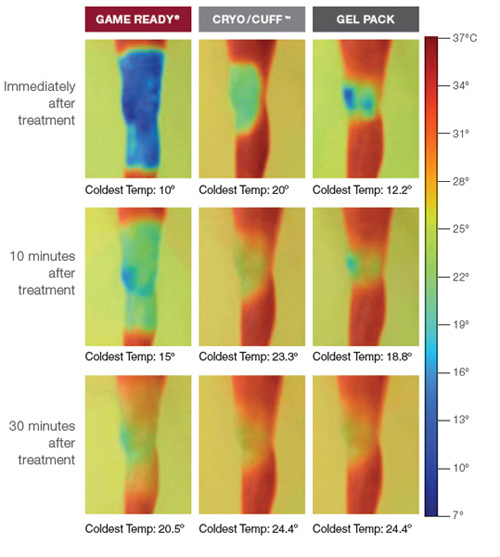 Infrared thermal imagery shows that Game Ready’s patented active compression technology enhances the delivery of cold therapy. Game Ready’s combination of active compression and simultaneous cold therapy facilitates faster, longer cooling. Game Ready Wraps provide circumferential therapy covering more surface area. Game Ready Wraps reach key pain points for ACL repair or total knee replacement patients such as the upper shin and back of the knee respectively. Adjustable Cold Therapy. Game Ready’s technology enables the continuous, rapid circulation of ice water throughout the circumferential body wraps before returning to pass through the ice reservoir in the control unit. As opposed to static applications of cold therapy, such as an ice pack or cuff, the continual flow of cold water means temperature can be maintained more effectively for longer periods of time. As the water is constantly moving, this eliminates freezing and the risk of tissue damage due to tissue being exposed to sub-zero cooling. The temperature can be adjusted using the temperature control dial. The temperature is adjusted using a diversion valve that proportions the flow of the water passing through the ice reservoir and anatomical wrap.The Control Unit is not a refrigeration unit. No compressed refrigerant gas/glycol/antifreeze is used. No heating elements are present. Anatomical Wraps. Game Ready does not take a one-wrap-fits-all approach. Our anatomically designed Dual-Action Wraps are designed to treat specific parts of the body: ankle, knee, left and right hip/groin, back, left and right shoulder, elbow/calf, wrist and hand. Comfort & Convenience. Easy to apply and comfortable to use, athletes and patients often ask for Game Ready by name. The system allows you to manage pressure, temperature, and treatment time settings with just the push of a few buttons, or select one of six programmed treatment cycles and the system will operate continuously, turning itself on/off according to the treatment selected, for 900 minutes. Portability. Game Ready’s optional Carry Bag allows you to conveniently transport and store the system. The Rechargeable Battery Pack will provide up to 7 hours of use, allowing the system to be used from the operating theatre to the ward, at home, on the team bus or on the touchline.